A warm surge which exceeded expectations in the past 5 days has pushed the Washington December average temperature to a tie for the 6th warmest in 141 years of climate history. Although it was well below the record of 70° set in 1965, today's high of 62° was 8° above the forecast from Monday and 18° above the climatological average. The morning low of 46° was 17° above its average and 2° above the average daily high. In contrast to the high, which was 8° from the daily record, the low was a whopping 59° away from the record of -13° set in 1880. The daily departure of 18° above average was the largest of the month and the 9th double-digit departure this December. There were 8 days in the month which had temperatures of 60° or higher. Watch How 2011 Became a 'Mind-Boggling' Year of Extreme Weather on PBS. See more from PBS NewsHour. The 0.06" of rainfall through 4 pm today pushes the Chicago year-to-date rainfall to 49.41", exceeding the previous second highest annual total recorded in 1983. The Beeb reports that Christmas 2011, the mildest in 90 years, was the third warmest in history for the UK. The highest temperature of 15.1°C was actually reported in the north, at Dyce, Scotland. For a full video report, click here. A balmy December is combining with the hottest month ever recorded to close out 2011 as the 4th warmest in Washington DC climate records dating back to 1871. 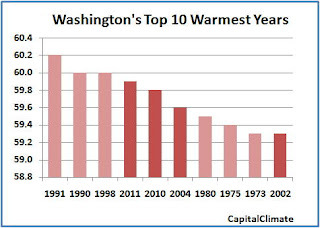 Based on the December average so far of 45.1°, which is 4.7° above the 1981-2010 baseline, the yearly average of 59.9° will edge out 2010 by 0.1° to take the 4th position in the Washington annual heat parade. Bumping 2006 into the 11th position, this year will take its place as the 5th year out of the last decade to be in the top 11 of all time. Three of the top 6 warmest years have now occurred in the 8 years beginning with 2004. Projected temperatures for the remainder of this week, while above the seasonal average, will likely lower the monthly mean to 44.6°, but that will not be enough to change the yearly average. The projected average would make this month the 7th warmest December in history. Indications for rest of winter? 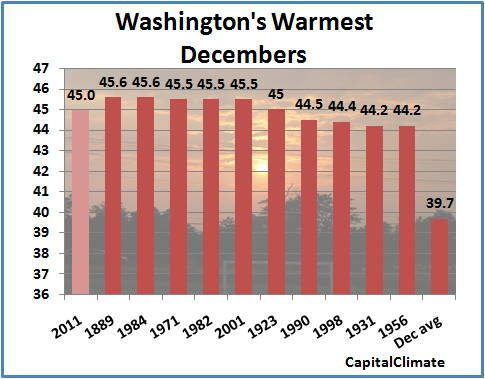 As reported here 6 years ago, December temperatures are virtually uncorrelated with January's in Washington. However, looking just at the warmest Decembers, there is some indication that seasonal snowfall is likely to be below average. 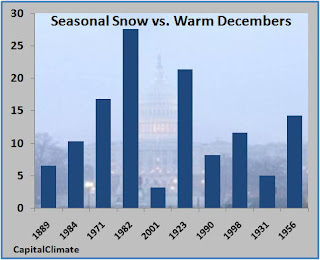 For the previous 10 warmest Decembers, the average total seasonal snowfall was 12.5", compared with a 1981-2010 average of 14.5". Only 3 out of the 10 seasons were above average. The highest was 27.6" in 1982-1983. Note, however, that 6.6" of that had already fallen in December, compared with a trace this year; the remainder occurred in February.